Cavalry Patrol on Watch at Twilight on the Somme - front page photo. showing a man in silhouette on his horse. Soldiers on Their Way to See Mr Massey, Premier of New Zealand, During His Visit to the Somme. Important Road on the Somme Front with Hardly a Tree Standing in the Surrounding Area. Tractors Used for Heavy Transport Work and Conveyance of Munitions etc. - inset photo. Balkan Plateau: Servian Artillery Horses helping to Haul an Officers Car Out of the Mud. Romanians Hurling Naptha into the Austro German Soldiers in the Mountains - full page (fp) from a drawing by (what looks like) John F. Campbell. A Rough and Ready Five O Clock Afternoon Tea Amid the Debris of the Somme Fighting - half page (hp) photo. showing soldiers sitting in the mud having a cuppa. Repairing a British Aeroplane at the Front - small inset. Wounded Soldier Being Carried Pickaback from the Battlefield Down Embankment to the Ambulance on the Somme - hp. Wounded Horses: RSPCA and Blue Cross Workers Tending Horses - hp. Artillery Horses In a Long Line Waiting to Be Watered - hp. Hauling Big Guns to the Front by Hand During the Advance in the West - hp. East Africa Campaign: Bringing Up Big Naval Guns - hp. 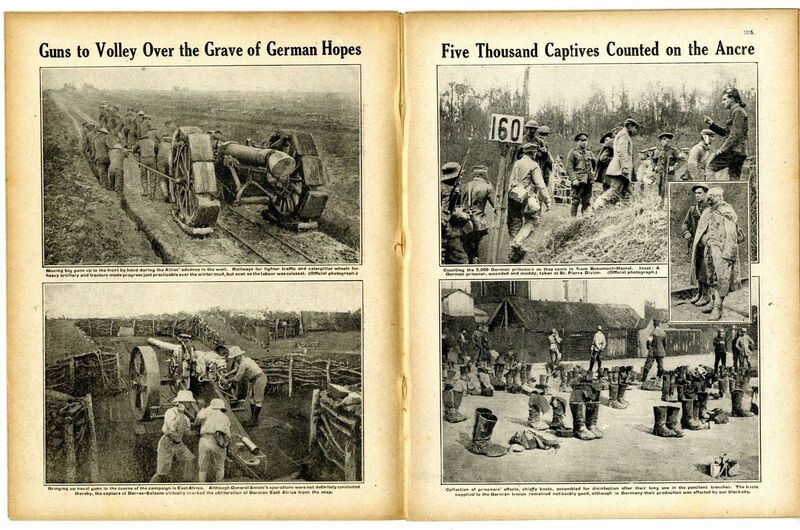 Counting German Prisoners as They Came in From Beaumont-Hamel. A Wounded and Muddy German Prisoner Taken at St Pierre Divion - inset. Collection of Prisoners Effect, Boots etc., Assembled for Disinfection. Canada's Day at Courcelette on The Somme: A Fierce Battle at the Sugar Refinery; Men With Bayonets Fixed Taking Shelter Behind the Large Cylinders of the Sugar Factory - full page from a drawing by Fortunino Matania. Lonely Soldier With Rockets on a Remote Part of Salonika Front. Serbian Soldiers Linking Communication Wires. Telephone Operator Testing the New Line. Recent Enemies, Bulgar and Serb, now Wounded, Smoke Cigarettes By the Wayside. Serbians About to Launch a Pigeon or Aerial Torpedo. Primitive But Effective Way of Conveying Serbian Wounded Over Mountain Tracks - strapped to the side of a mule or horse. French Officer Interrogating Captured Prisoners - inset. Wounded Being Carried on a Double Saddled Chair. Arthur at the Front: A London Coffee Stall Behind the Lines - info. although it does not say, this is at Aveluy, Somme. The Tanks in Action on the Somme After Several Weeks the Veil of Official Mystery Has Been Lifted - fp from a drawing showing men with bayonets fixed taking cover behind advancing tank close to the caterpillar tracks. One Hour Before the Dawn of Victory and the Concentration of French Troops on a Somme Road: The Poilus Massed and Awaiting the Attack on Sailly-Saillisel - fp photograph. Little Wooden Church Erected in the Vicinity of the French Front. Chapelle de L'Esperance by a French Soldier Artist, Holder of the Prix de Rome. Another View of the Interior of the Chapelle de L'Esperance. Historic Photograph Taken Just Before the Capitulation of Kut: General Townshend with His Staff incl. Colonel Annesley - Brigadier General Evans - Colonel P. Hehir - Major Gilchrist - Colonel Chitty - Colonel Maule - Colonel Parr - Colonel Wilson - and others. Battalions of Lumbermen Who Have Denuded Whole Forests of their Timber. British Soldiers Taking Shells up to the Guns Along a Light Railway. Dragging a French Howitzer into Position. 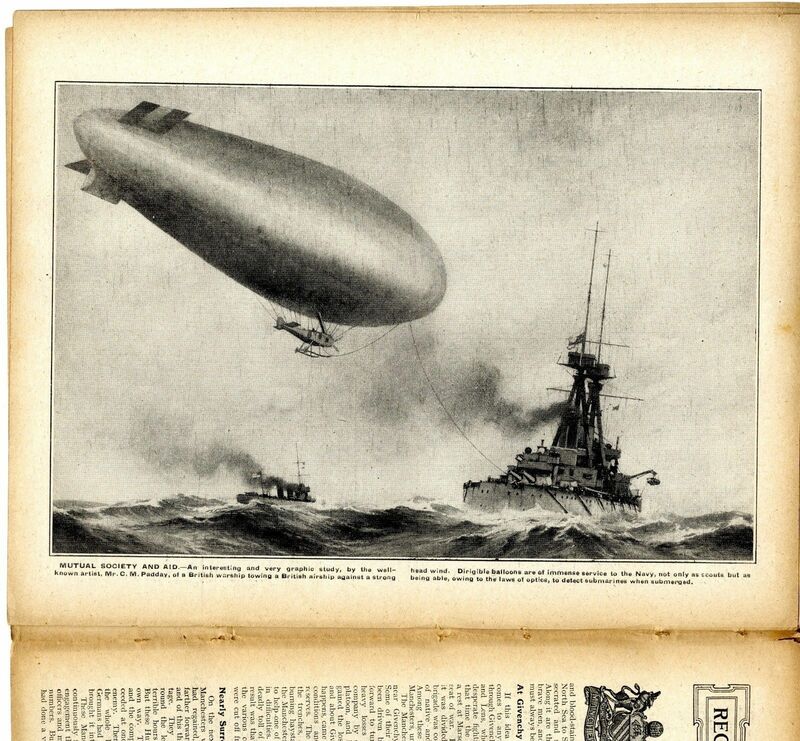 British Warship Towing a British Airship Dirigible Against a Strong Head Wind - fp from a drawing by C. M. Padday. Russian Ambulance Carrying an Armenian Red Cross Doctor Who has Dealt With Thousands of Refugees - hp. Contingent of Russians Arriving at Salonika - hp. Nurses Preparing an Open Air Treatment Centre Made of Grass Matting for Consumptive Soldiers at a Military Hospital in Cairo. Convalescent Wounded Soldiers Trip to the Pyramids. Officers of a Company of Imperial Camel Corps: Sec. Lt. Orchardson - Lieutenant Gregory - Captain Lord Winterton - Sec. Lt. Hon.Leslie Melville - Lt. Mills of The Australian Imperial Forces - inset photo. Temp Captain Eric R. Wood MC and Bar. Able Seaman H. J. Boutell DSM for Action in the Battle of Jutland. Rev. Canon C. S. Woodward MC. Acting Corporal Leo Clarke VC - Canadian Infantry. Captain F. Longueville DSO MC - Coldstream Guards. Lieutenant J. A. Mann MC - Scottish Rifles and RFC. Company Sergeant Major J. Baxenden MC - Cameronians - For action at Martinpuich. Captain E. E. Wookey MC - Gloucestershire Regt. Sec. Lt. J. N. Richardson MC - Royal Berks Regt. Sec. Lt. J. S. Grant MC - Gordon Highlanders. Sec. Lt. A. H. Blowers MC - Machine Gun Corps. Captain A. D. Spark MC - Gordon Highlanders. Lance Corporal H. W. Lane DCM - Grenadier Guards. Sergeant Major Frost DCM - New Zealand Infantry - Killed at Armentieres. Sergeant F. E. Garton DCM - Leicester Regt. Private J. Walsh DCM - West Riding Regt. The Manchester Regiment and a record of the various regiments and campaigns incl. WW1. With mention of Colonel Strickland 1st Batt. - Lt. Col. H. L. James 2nd Batt. - Sec. Lt. James Leach and Sgt Hogan 2nd Batt. - Colonel H. W. E. Hitchens - Gen. Noel Lee - W. T. Forshaw 9th Batt. - Cpl S. Bayley - etc. From Czernovitz to Romania; An Escape from the Austrians. 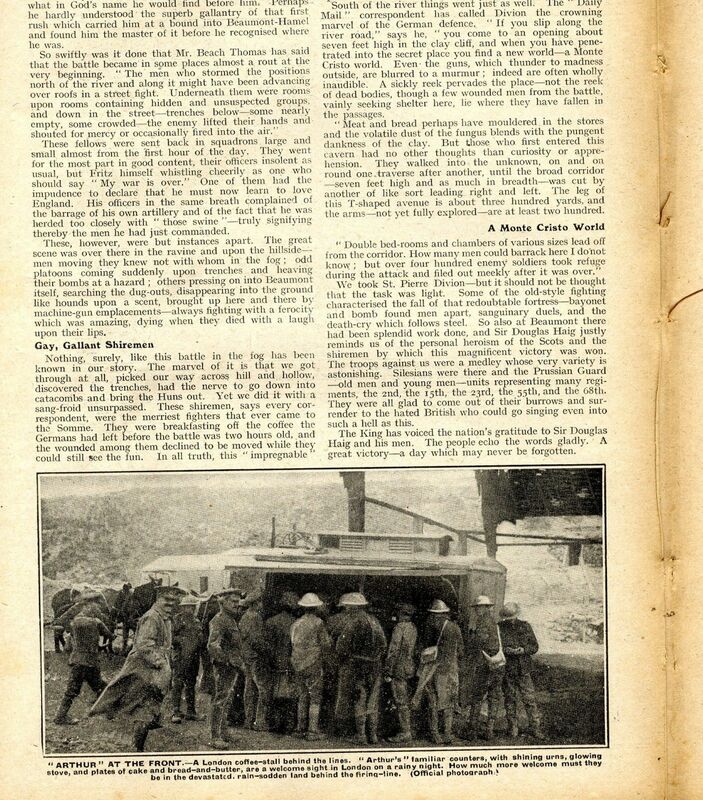 An account from the war correspondent Basil Clarke. 12 pages (24 sides). It measures 285mmx220mm (11.25 x 8.5") approx. There are binding witness marks on the spine. The pages are loose with binding witness marks. There is age yellowing/toning and some marking. Some creases etc to corners and handling marks to edges. Images, photos sketches etc. vary in size.